OfficeSuite is a pretty capable file browser too, but Astro comes preinstalled and has even more functions. Its welcome screen gives you easy access to your photos, music, documents, it lets you back up apps, kill running apps and check which folders are eating up precious storage space on your memory card. Tap on the Manage my files button and you get into the full-blown file browser. It can do all the basic stuff (new folder, copy, delete, etc. ), plus batch operations, search for files and ZIP multiple files and folders. There is also a calculator aboard. It is nicely touch optimized - the buttons are really big and easy to hit. You can expand advanced functions (trigonometry, logarithms). Play Books came preinstalled. The eBook reading app features several preloaded books (Frankenstein, children's stories by Hans Christian Andersen and Pride and Prejudice). The app has an attractive page turn effect and, of course, lets you add new books to your collection from Google's store. You can also make books available offline (by default they're pulled from the web on demand), change various text display options to make reading more comfortable and enable the Read out loud option, if you feel like a bedtime story. 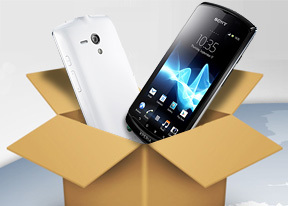 The Sony Ericsson Xperia neo L comes with a GPS receiver, which took about a minute to get satellite lock upon a cold start. You can use the A-GPS functionality to get near instantaneous locks. Alternatively, network positioning will do if you only need a rough idea of your location. You can plan routes, search for nearby POI and go into the always cool Street View. The app will reroute you if you get off course, even without a data connection. Our Xperia neo L came with a Wisepilot trial with 30 days' worth of a full navigation license. The app offers info on weather, traffic, speed cameras and alerts. If you decide to go with the online-only version, the Abroad mode makes sense. It will reduce roaming data usage and maps are cached (so, you if you start off at home or your hotel with the phone hooked up to a Wi-Fi network, you'll save even more). We just can't promise you that your Xperia neo L will also come with the same Wisepilot license, it may be a region-specific feature. The Sony Xperia neo L is running ICS, so it has access to the latest apps (like Chrome), but the limited amount of app storage means you'll need to be careful with large apps (again, like Chrome) or move a lot of the apps to the microSD card.